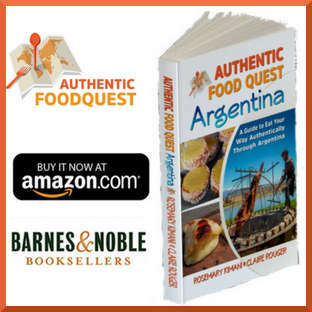 Our journey discovering authentic food across South America continues and now has us in Uruguay. 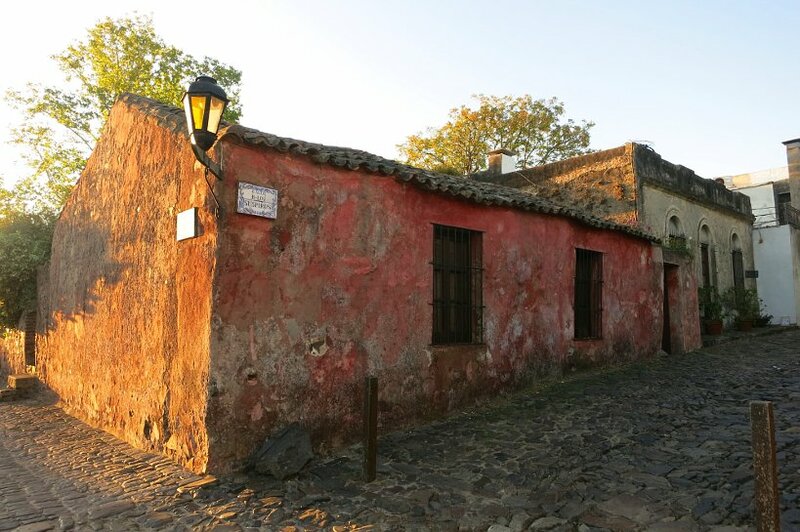 More specifically we are in Colonia del Sacramento, a picturesque town and the Barrio Historico (historic quarter) was declared a World Heritage Site by UNESCO in 1995. In case you may be wondering, Uruguay is South America’s smallest country with a population of about 3.3 million. The capital is Montevideo and that is our next stop on this adventure in Uruguay. Stay tuned for more in the next posts. 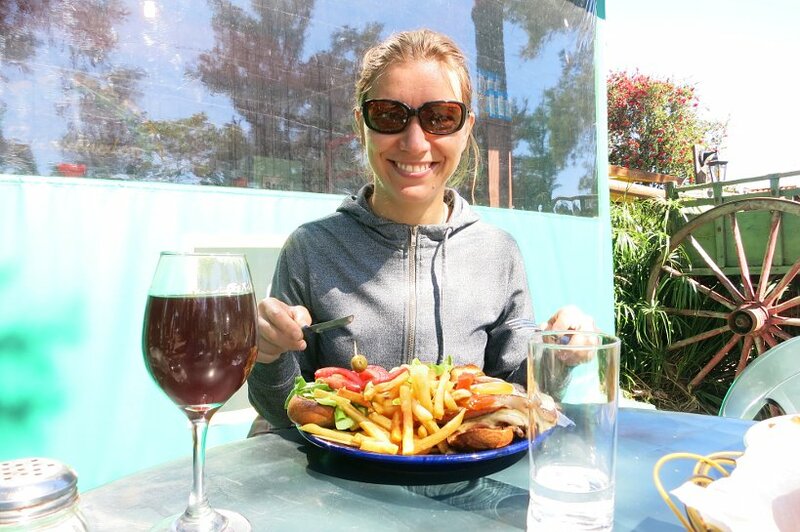 Our trip to Uruguay was both practical and also to discover the famous Chivito sandwich. On the practical end, we needed to leave Argentina before the expiration of our tourist visas so that we would be able to come back into the country on a new tourist visa and continue our travel adventure to the south of Argentina. 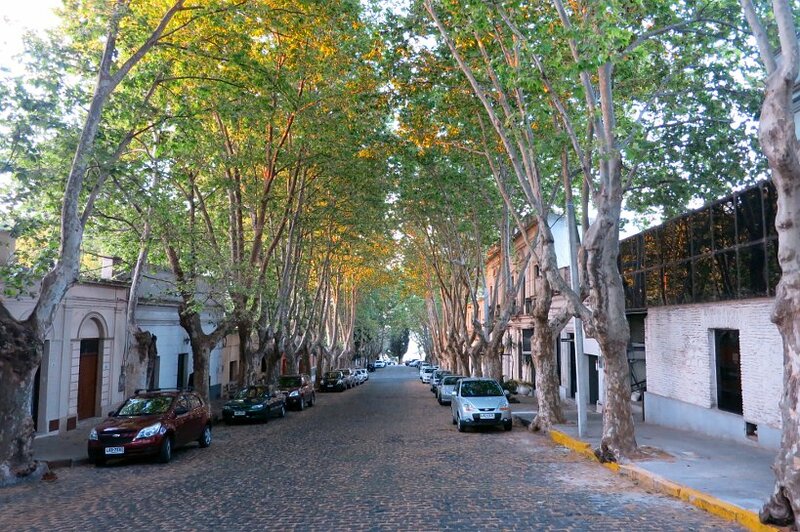 Colonia in Uruguay is conveniently located literally across Buenos Aires and is easily reached by ferry by crossing the Rio De La Plata. 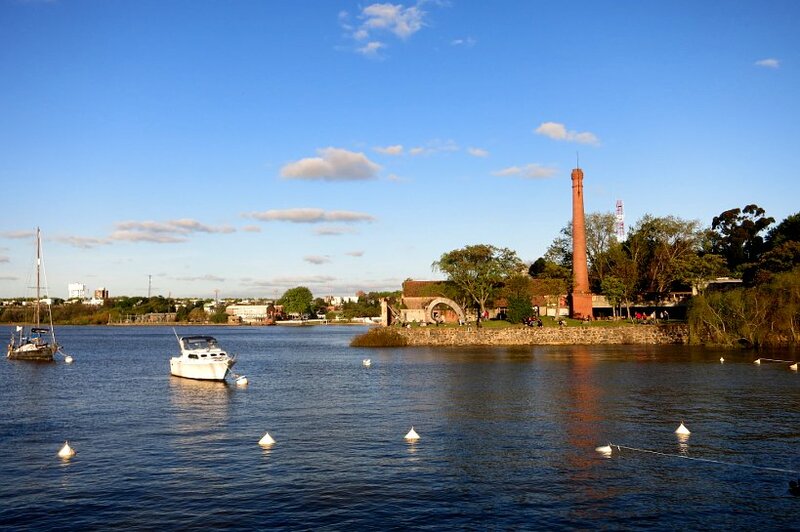 There are two main companies that provide ferry service to Colonia from Buenos Aires; Buquebus and Colonia Express. We took Colonia Express, and in just about one hour we landed in Colonia. Easy and convenient to get to, Colonia is also visited by many porteños (locals from Argentina) for a day trip. Now, onto the sandwich. Being a national speciality, there was no shortage of places with Chivito Sandwich on the menu. It took us a little time to find a restaurant that we liked. 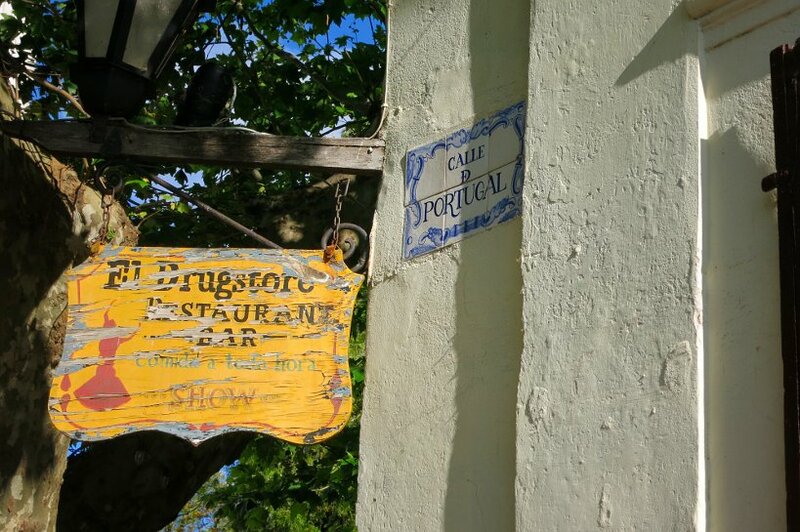 As we were touring the old city of Colonia, we spotted El Drugstore, a quaint restaurant with live music, serving the speciality. Once we settled down at El Drugstore restaurant, we ordered the chivito al plato (chivito as a platter). This is a serious dish filled with meat. 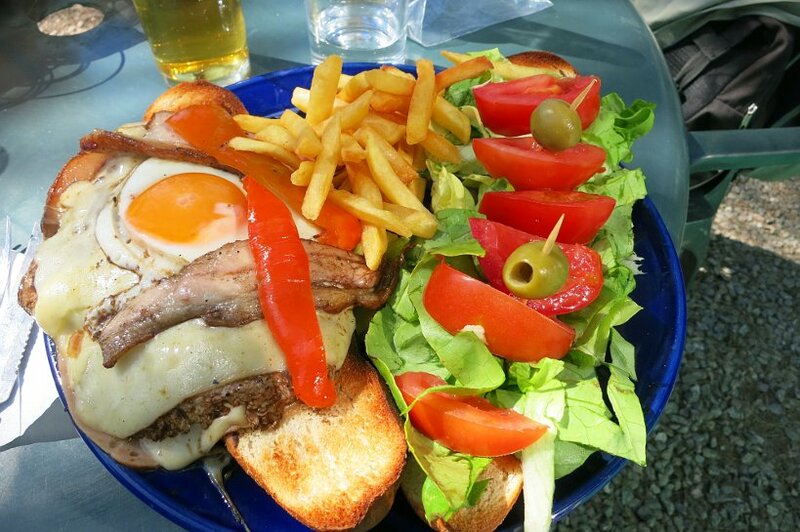 It is made up of a thin slice of churrasco (filet mignon beef), topped with bacon, mozzarella cheese, tomatoes, lettuce, mayonnaise, ham, olives and a fried egg. It is mentioned on the menu as a meal for one or two. We highly recommend to take it for two as it is very filling. When it is served as the platter, it comes without the sandwich bread and it is usually served with french fries or baked potatoes. Incredibly delicious is how we both described our first bite of the Chivito Sandwich. Rich, heavy and something about all the flavors together, works very well. Decadent and a carnivores fantasy, it is actually surprisingly good. We were overly stuffed and can now understand intimately why the Chivito Sandwich is the national Uruguay dish. 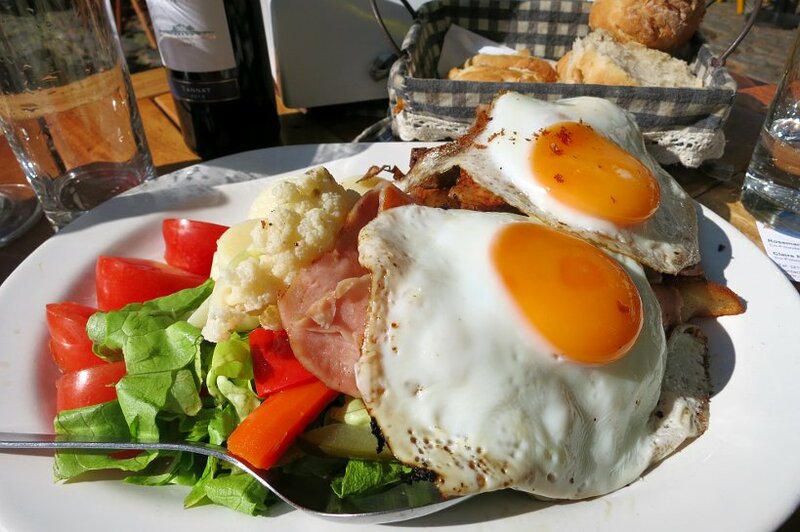 Apparently, legend has it that a female tourist from Argentina stopped by a restaurant in Punta Del Este (Southern part of Uruguay) and ordered “chivito” (baby goat meat) like the ones she had in Argentina. The restaurateur not wanting to lose a client, accepted the order and proceeded to make her a churrasco (steak, not goat) sandwich topped with everything but the kitchen sink. She ends up loving it and the sandwich earns a permanent place on his menu under the name Chivito, going on to become Uruguay’s national sandwich. We had tried the Chivito platter, and now needed to try the sandwich. The opportunity presented itself the next day after we took a 5km walk over the Rambla de las Americas, along the water to Real de San Carlos. This is worth noting because there you will find the largest bullring (where bullfighting is performed) in South America. 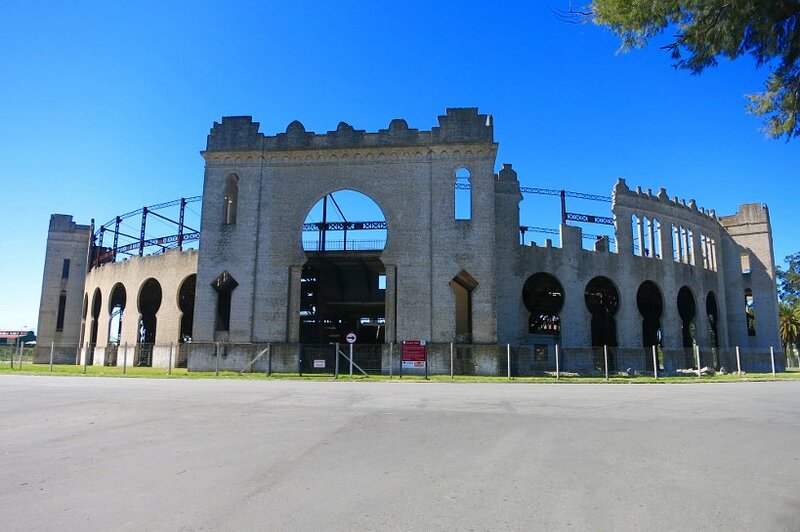 It was built at the beginning of the 20th century by Nicolás Mihanovich, an Argentine business man. The Plaza de Toros (bullring) opened in 1910 and could hold up to 10,000 people. It was only opened for 2 years and held 8 bullfights in total. Bullfighting was finally outlawed in 1912. Legend has it that the President of Uruguay at the time, Jose Batlle y Ordóñez once attended a bullfight with his daughter and upon seeing how the bulls were treated and finally killed in front of everyone, she cried and complained so much to her father that the sport was finally banned. So, while we were in the Plaza de Toros area, and after a walked that prepped our stomach for some consequent food, we stopped at at a clean looking shack called Lo De Pedro on ave. Mihanovich leading to Plaza de Toros and this time ordered the Chivito Sandwich. As you can see, it closely resembles the chivito al plato just with the addition of the bread. Overall, the two different type of preparations of the chivito – al plato or with bread as a sandwich were pretty much the same. After all the Chivito, and if you are looking for a break be sure to check out Buen Suspiro, a cozy spot specializing in picadas (finger foods to nibble on) on the most emblematic street of Colonia, Calle de los Suspiros. 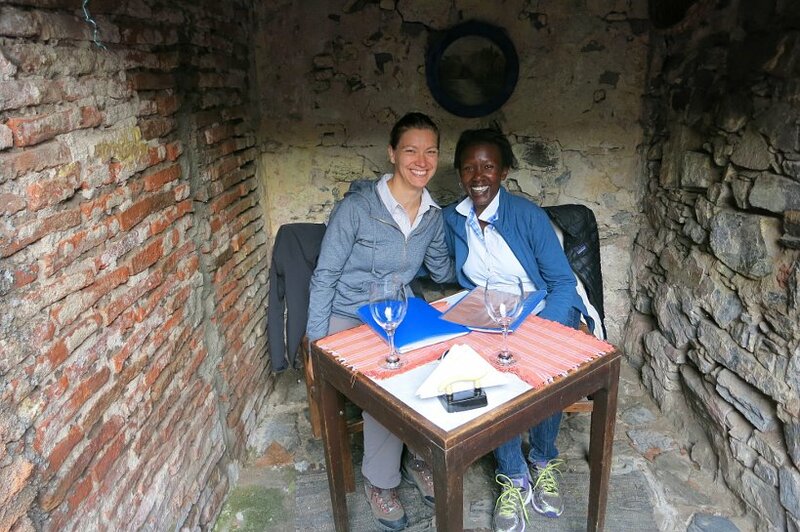 Here we enjoyed 4 different types of cheeses, chorizo sausage and slices of two different types of tartas (quiche-like). We downed this with amazing Tannat wine, a speciality from Uruguay that we also discovered in Cafayate, Argentina. 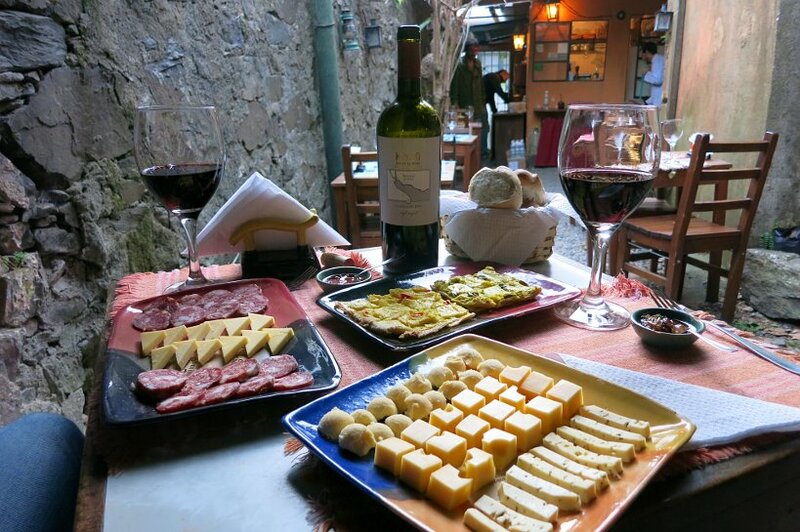 If you’ve never considered visiting Uruguay, we encourage you to put it on your radar. 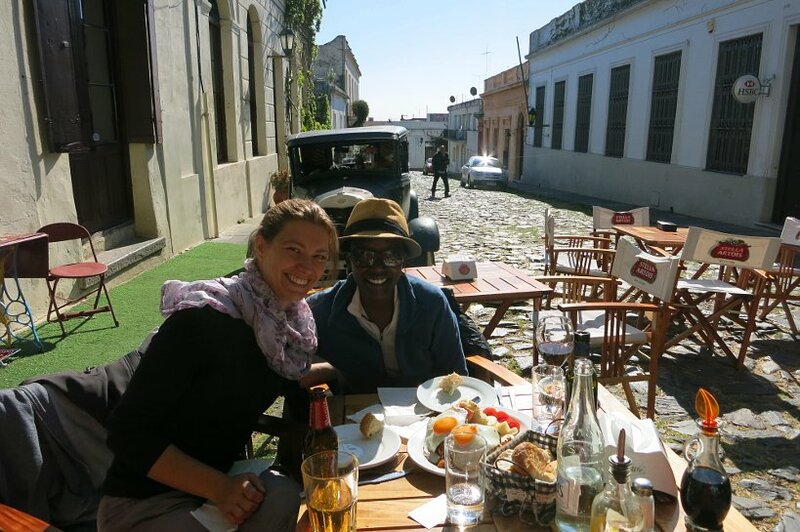 Colonia Del Sacramento is only a short distance away from Buenos Aires in Argentina and it has an entirely different feel. Here is more about Colonia in pictures. Es un placer contar con tu preferencia. ? ?¡Buen Viaje • Bon Voyage • Boa Viagem! 🙂 ► http://bitly.com/FacebookCoEx ?? You found what looks like the best places to eat there! I’ve heard about this sandwich and even seen some pictures, but these versions look the best of any I’ve seen. I already like El Drugstore, just for the name, but that platter definitely wins me over. The sandwich version looks even better! Thanks so much Laura for your comments. This sandwich is incredible – both in size and taste. Grab any chance you can to sink your teeth into a Chivito. Glad you like the pictures 🙂 Cheers! Buen Suspiro sounds delicious. I love snack foods, especially cheeses. I really love learning about different food culture! This is truly something worth reading. Love your share! 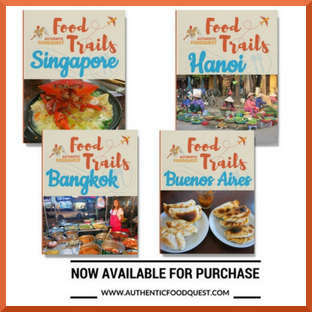 I hope to read more from your food adventures. Thanks so much Karla. Love that you found this interesting . 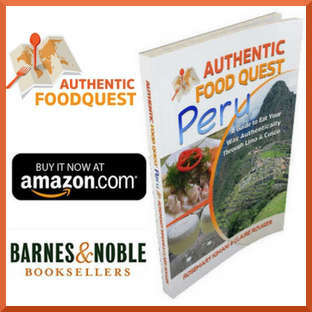 We do believe that when people travel through food, they have a deeper connection with the local people, food and culture. Do join and follow our adventure. Thanks for your comments! I have never heard about the Chivito sandwich, but I must say it looks like the perfect combination of meat and vegetables that will make it a great tasting sandwich. Uruguay is one of the South American countries I will be visiting in the future, so I will continue reading your articles to get the 411 on the place. Thanks so much and glad that you will stay engaged to understand the local specialties in Uruguay. 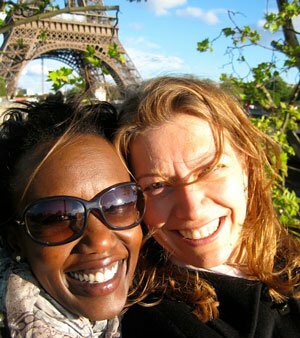 Don’t hesitate to reach out via email as well for additional questions as you get closer to your trip. 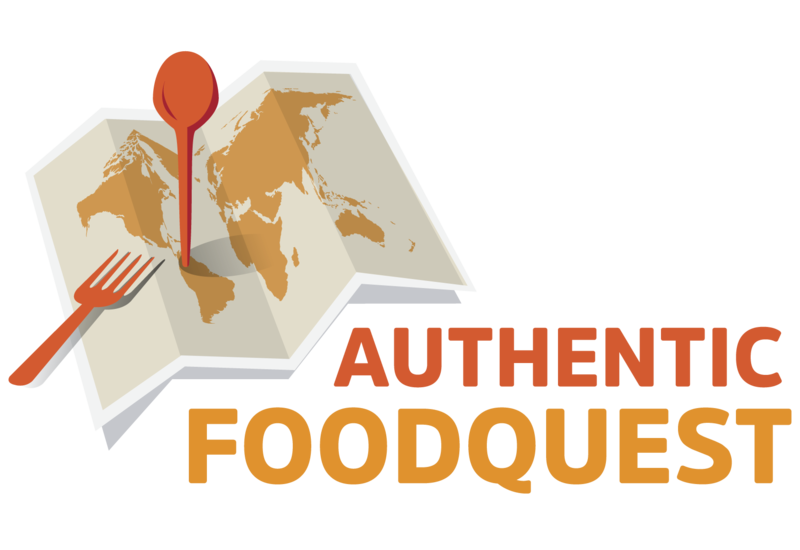 Join us and stay engaged and see the dishes not to miss out on in Argentina, Chile and Peru, especially if your travels go beyond Uruguay. Happy to help!! I always try local food wherever I’m travelling to, I love the fact that you guys are on a mission to get the true experience. You can find out so much about a place because of the food, the way they prepare it, the way it’s cooked and presented, where the ingredients come from, just everything! You nailed it Melissa. 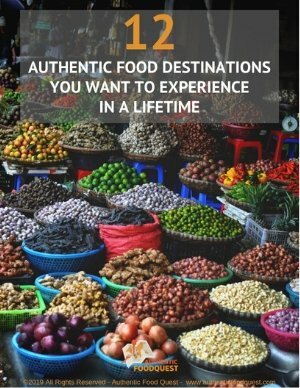 Our mission is inspire travelers to travel through food for a deeper connection to the local people, place and culture. Through food we can learn so much 🙂 Thanks so much your feedback. That sandwich looks yummy. I really want to visit Uruguay. It looks interesting and I now know the food scene is amazing. I am a huge fan of eggs on sandwiches. Hi Jennifer, Uruguay is a very beautiful country and quite surprising. Do make a point to visit. In terms of the food scene, beside the Chivito, which is the national sandwich. The other huge local speciality are Parillas (barbecues). Amazing food, though not much diversity. Be sure to check out the farmers markets.